A history of design that is often overlooked—until we need it Have you ever hit the big blue button to activate automatic doors? Have you ever used an ergonomic kitchen tool? Have you ever used curb cuts to roll a stroller across an intersection? If you have, then you’ve benefited from accessible design—design for people with physical, sensory, and cognitive disabilities. These ubiquitous touchstones of modern life were once anything but. Disability advocates fought tirelessly to ensure that the needs of people with disabilities became a standard part of public design thinking. That fight took many forms worldwide, but in the United States it became a civil rights issue; activists used design to make an argument about the place of people with disabilities in public life. In the aftermath of World War II, with injured veterans returning home and the polio epidemic reaching the Oval Office, the needs of people with disabilities came forcibly into the public eye as they never had before. 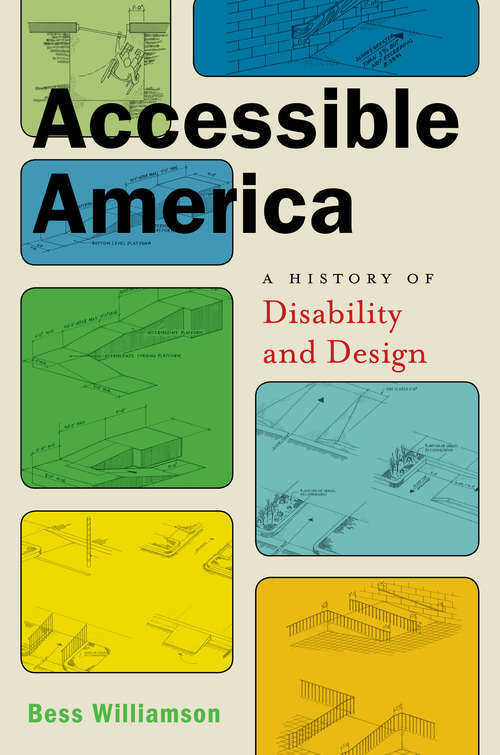 The U.S. became the first country to enact federal accessibility laws, beginning with the Architectural Barriers Act in 1968 and continuing through the landmark Americans with Disabilities Act in 1990, bringing about a wholesale rethinking of our built environment. This progression wasn’t straightforward or easy. Early legislation and design efforts were often haphazard or poorly implemented, with decidedly mixed results. Political resistance to accommodating the needs of people with disabilities was strong; so, too, was resistance among architectural and industrial designers, for whom accessible design wasn’t “real” design. Williamson provides an extraordinary look at everyday design, marrying accessibility with aesthetic, to provide an insight into a world in which we are all active participants, but often passive onlookers. Richly detailed, with stories of politics and innovation, Bess Williamson’s Accessible America takes us through this important history, showing how American ideas of individualism and rights came to shape the material world, often with unexpected consequences.